'Prakash na Panthe' is an astounding and revealing autobiography and undoubtedly, one of the most popular and widely read book of Yogeshwarji. Gujarati literature can boast of a very few biography or autobiographies, and a handful among them are of saints and spiritual figures. 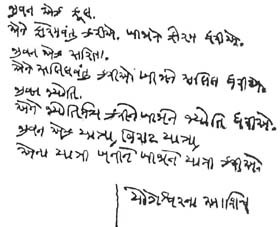 In that context, Yogeshwarji's autobiography is worth a treasure for Gujarati people. As Yogeshwarji has narrated in this book, he was in the habit of keeping a diary right from his childhood and he continued it over an extended period of time. It was his favorite way of observing life and drawing conclusions thereof. Later, blessed by divine inspiration, it assumed the shape of this priceless book. His autobiography reflects nothing but an honest account of his life, the twist and turns it took and the obstacle it faced to reach its destination. Just as the life story of a politician would be mostly filled with political details, a soldier's life story would contain details of the army, bravery and battles; the life story of the one who travels along the path of enlightenment would have in it only references to spiritualism and Sadhana - what else could it have? The humanity got 'Bhagvad Gita' when Arjun's mind got clouded with confusion and questions were raised in the battlefield. The 'Bhagavata' came into being when King Parikshit deeply repented over his misdeeds and in that perplexed state of mind asked question what a mortal should do. In more or less the same way, the questful mind of Shri Yogeshwarji longed for the experience of the eternal truth existing in the universe. He gave up all the worldly possessions and accepted spiritual seclusion in the holy Himalayas. He undertook severe penance and ultimate realized the supreme reality prevailing in the universe. The literary manifestation of that legendary journey is depicted in his autobiography 'Prakash na Panthe'. This autobiography reveals the story of Yogeshwarji's self development; how various types of visible and invisible obstacles and afflictions stood in his way & how overcoming the stiffly traits of human nature and worldly people's mentality he reached Himalayan heights; how his pious and righteous life became living center of pilgrimage and got blessed with the capability to turn others into the center of pilgrimage. This autobiography should be understood and evaluated in this spirit so as to inspire and ignite the inner self. It's an astounding literary journey into his extraordinary life, a timeless saga of his evolution from an unknown village boy Bhailal (his birth name) to a highly revered Mahatma Yogeshwar. The book illustrates his meetings with magnanimous saints and accomplished souls, his miraculous darshans and breathtaking spiritual experiences, his thoughts on prevailing socio-economic and political condition of time and his guidance to aspirants for spiritual advancement. 'Prakash Na Panthe' is an invaluable guide and companion for all spiritual aspirants and an unparalleled autobiography of present time. This autobiography was first printed in the year 1977, and thereafter due to popular demand, it was translated in Hindi (प्रकाश पथ का यात्री) as well as English (Steps towards Eternity). An abridged version in Gujarati has also been published. Recently, enhanced second edition of this autobiography has been published by Sahitya Sangam, Surat, wherein Shri Yogeshwarji's later years life has also been incorporated. Yogeshwarji's spiritual tour of UK, USA and Canada are covered in greater details and Maa Sarveshwari's introduction in Yogeshwarji's own handwriting as well. Through the medium of this website, this great spiritual treasure is made available to all spiritual aspirants. It should be noted that chapters has been broken down and titles has been modified to suit online reading without changing the contents of its print version. For the information of readers, English and Hindi translation presented on this site is a humble attmpt made by webmaster to reach wider audience, and is not part of any published books. જે કલા મનુષ્યને એની સાંપ્રત દશામાંથી ઊંચકીને સાત્વિક ને શુદ્ધ આનંદના પ્રદેશમાં મૂકે, શાંતિ ને પ્રેમના પ્રવાહમાં વહેતો કરે, તથા શરીરની સ્મૃતિ પણ ભુલાવે એટલે કે આત્મા સાથે એક કરે, તે કલા ઉત્તમોત્તમ કલા કહી શકાય.